Based out of Greensboro, North Carolina, JFJones Mobiles has been a passion project in the making for almost ten years. Founded by husband and wife team, Jay and Naomi Jones, JFJones mobiles has strived to capture the beauty and whimsy of the natural world and bring it to the public. In early 2006, Jay was inspired to recreate the leaves of the ginkgo trees that line the streets of downtown Greensboro out of copper. Since then, his work has been featured in print and on NPR, and is now part of numerous private collections. 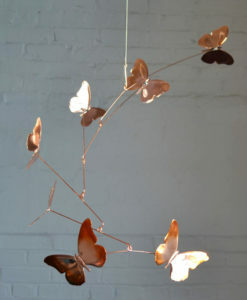 There are now six varieties of naturally-inspired mobiles available and a line of Modern Mobile kits for retail and wholesale.